VIOLIN CASE - MODEL "MILANO-B"
which bigger weight in comparison with those made of styrofoam recompenses better durability and protection. Inside of the case is made of two colours of chamois leather and velvet. characteristic feature is compartment for violin headstock in charming shape of a wine glass. It also contains three compartments – one bigger for shoulder rest and two smaller located symetrically on both sides of a violins neck. 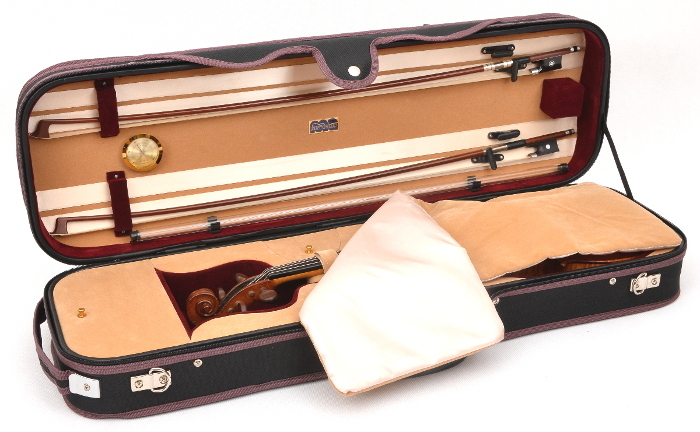 Elegant case for violin is equiped with comfortable leather handle. It has additive key lock that increases safety and convinience. The violin case ensures good protection.